Home » Trains Feel More Crowded? That’s Because They Are. Trains Feel More Crowded? That’s Because They Are. Submitted by mas_admin on Tue, 2008-07-22 23:40. 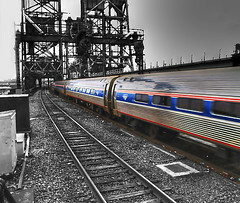 In 2008, 5.6 million passengers traveled the Northeast corridor (Washington to Boston), versus 5 million in 2007, an 11% increase. Travel on Acela, the Northeast-only express service, increased by 8%, from 2.4 million to 2.6 million riders..